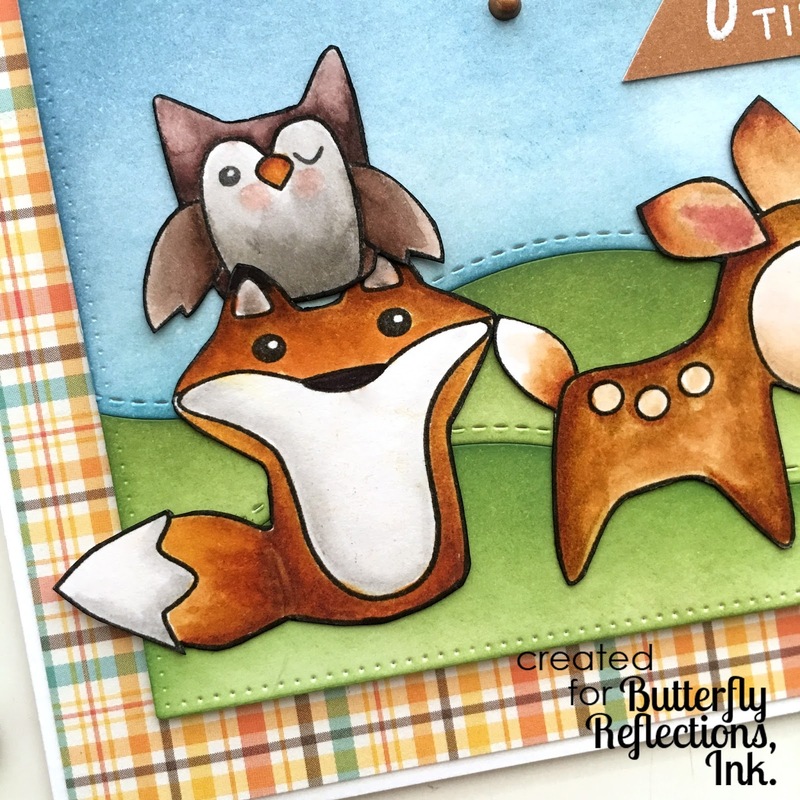 Hi folks, Norine here, with a fun critter card to share. 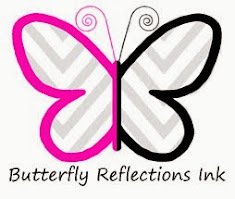 In the spirit of full disclosure, my original idea was different than the end result. Some days that's just the way it goes and the sooner I accept that the card has different ideas from mine, the happier everyone will be! 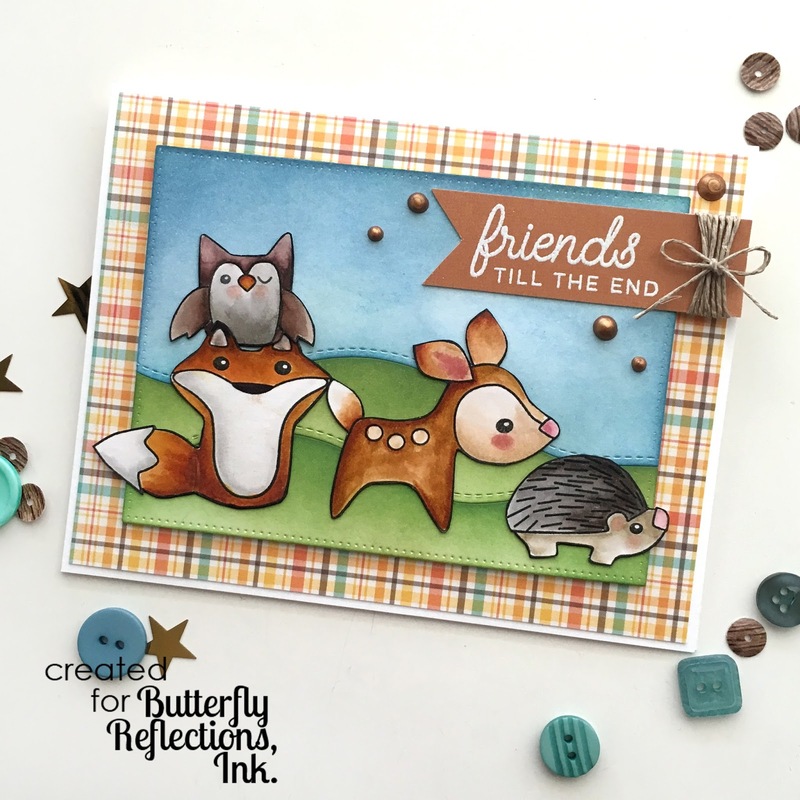 I stamped the four critters from two different Right at Home stamp sets, Deerest Friends and Friendly Fox, (and both sets are currently on sale in the store!) onto Strathmore Bristol Smooth cardstock, so that I could color with my Kuretake Zig brush markers, and the color would move and blend easily. After stamping and coloring, I fussy cut each piece. 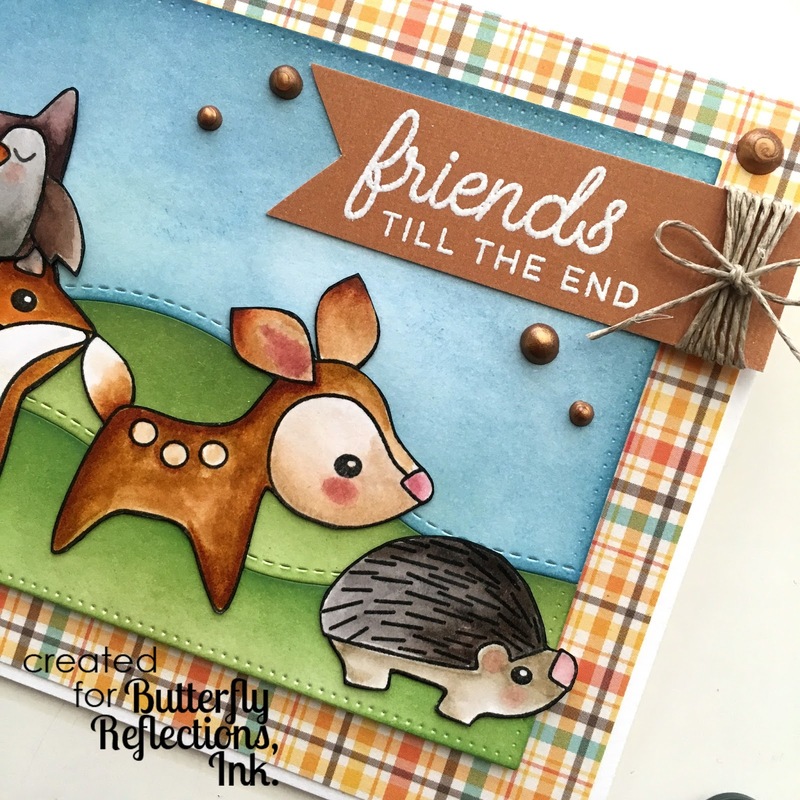 Next, I cut a 3 1/4" x 4 1/2" panel of cardstock, with the Die-Namics Pierced Rectangle die, and then sectioned it into sky and two layers of hills with the Lawn Fawn Stitched Snowdrifts die. I blended the color onto the hills (Mowed Lawn, Shabby Shutters and Pine Needles) and sky (Broken China and Faded Jeans) with Distress Inks and a foam applicator, pieced them together and mounted them with foam tape before adding the colored critters on top. It was clearly a day when I needed a little color! I stamped and white heat embossed the sentiment on the fishtail banner and then wrapped the end with some jewelry-making jute I had in my stash. 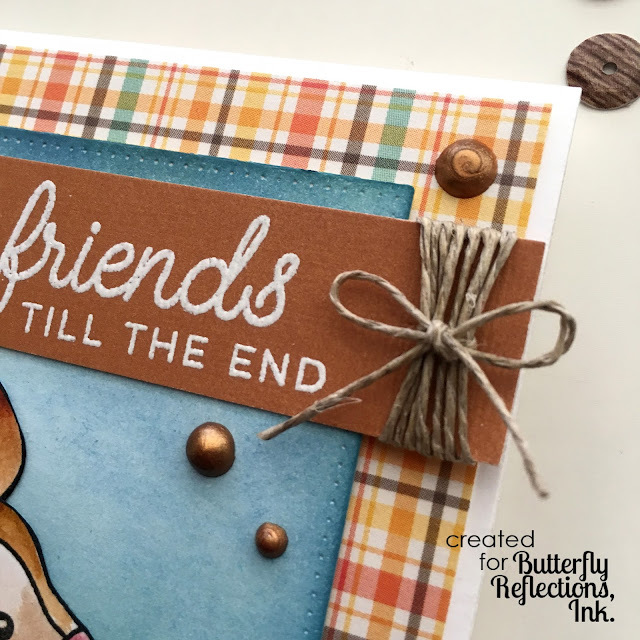 The addition of a few copper colored Tonic Nuvo Crystal drops completed the card. 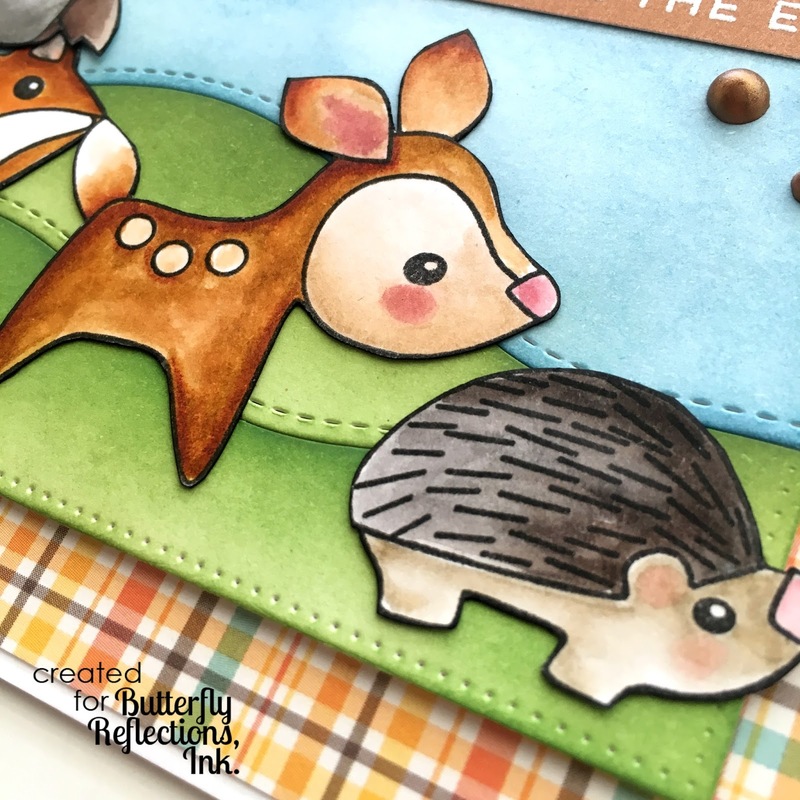 The background plaid patterned paper is from a Lawn Fawn 6x6" paper pad. Thanks for stopping by today and I'll see you again in a week!